This week I had planned to film an instructional video to show you guys how to fix a camera that has light leaks. I figured it would be appropriate to tell you how to fix them after I told you how great they were in my last post..er, anyways, the reason I wanted to teach you how to fix your light leaks because on black and white film they aren’t so pretty, they’re actually quite creepy. The video didn’t work out because I still have a film of Tri-X B&W film in there that has a few frames left. I’m not one to waste film so I figured I’d do the video blog next week after it’s finished. 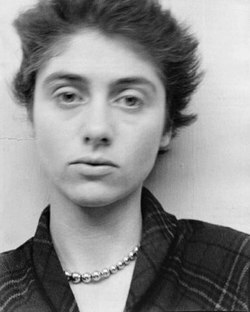 This week I’m going to introduce you to Diane Arbus instead! Her name is almost synonymous with creepy and dark. The woman did kill herself at the age of 48. Before her suicide act, Diane Arbus completed a body of work that is both eerie and fascinating. She enjoyed photographing dwarfs, circus people, transgenders, nudists, twins, giants and deformities. As Diane put it, “the camera can be a little bit cold, a little bit harsh”. Diane Arbus grew up wealthy, born in 1923 she escaped the harsh reality of the Great Depression which is surprising because her work is so dark and emotional. Since this blog discusses old style film cameras, I suppose I should tell you what type she used. For her earlier work she used a 35mm Nikon camera but then switched to a twin-lens reflex Rolleiflex. During her professional career she photographed for Vogue, Seventeen, Glamour, Esquire, and Harper’s Bazaar though she hated fashion photography. I’d say more, but her photographs leave a greater impact than any type of historical facts about her could. So I’ll just leave them here. Since her death in 1971, Diane Arbus’ work has continued to live on by traveling around the world in exhibitions and has been sold for an upwards price of $500,000 per print at auctions. There is even a movie made about her starring Nicole Kidman called Fur. Hopefully you have enjoyed the dark facets of Diane Arbus like I did. She is a great influence to my own work as well as many others. Her decrepit, dark and raw portrayal of life tells us that not only the pretty things are worthy of being photographed. ← Can’t Develop Your Own Film? No Worries! Me too! The strange and unusual are what fuel my passion for photojournalism. When I look at her photos I feel like I’m looking at a snapshot or a possible poster for a horror film or old circus photo. I love them. For some weird and maybe even weird curiosity she makes you want to see more. Yes! Arbus is a master of depicting the strange just as they are and still making them appear eerily beautiful. These photos all make me think of times past… Wonderful article and photos though weird and eerie. This is a crazy post. I love it! I am a firm believer in the notion that the weird people are the fun people, and I can tell from Diane Arbus’ photos that weirdness was on both sides of the camera. Agreed! Weird is very much my interest and inspiration. The photo of the large eared twins is by Roger Ballen. I’m really disappointed that this article has lead people to believe it’s an Arbus for so long, tainting both artists with the stank of journalistic error.